Lyons Farmette and River Bend wedding photography by Colorado wedding photographer Mark Creery Photography. I love the rustic charm that the 7-acre Lyons Farmette provides, with its fun animals like goats and alpacas. Located near the St. Vrain River, Lyons Farmette is a perfect place for wedding photos, with the large cottonwood trees, stream and even a vintage Airstream trailer for the bride to get ready in. The small organic farm brings rustic authenticity to the space. This space has room for up to 125 guests. River Bend is a separate venue from the Farmette, and is right up against the banks of the river under red cliff sides. There is capacity for up to 200 guests. They have a cool tent for use, even a glamping tent for brides, and a cottage for the groomsmen. There are even tiny homes on the property that can be used by guests. 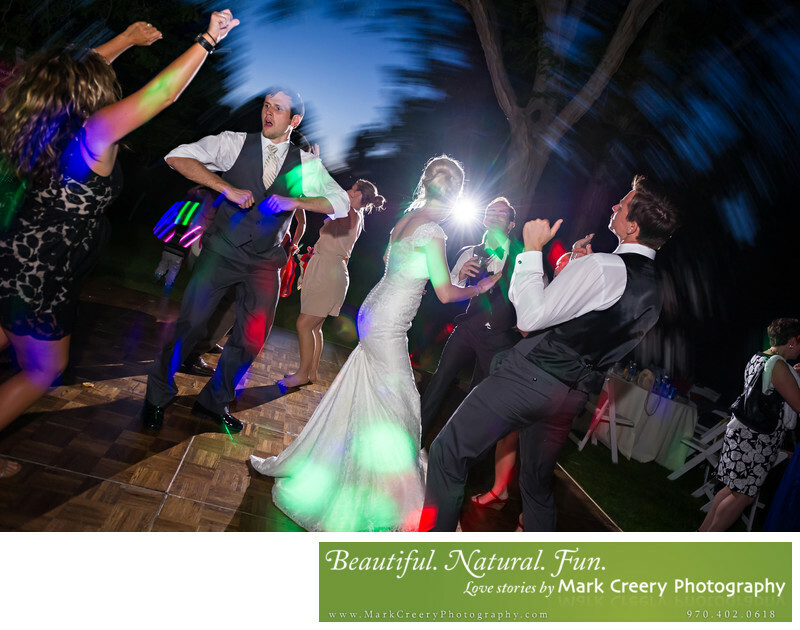 This wedding photo shows some fun partying on an outdoor dance floor with the bride and groom. I tried to accentuate the atmosphere by creating motion blur when I snapped the photo, and used a slower shutter speed to capture more ambient light and the deep blue evening sky. The Lyons Farmette and River Bend is located in Lyons, Colorado. Contact: Betsy, (303) 746-6266, betsy@lyonsfarmette.com. Location: 501 W. Main St, Lyons, CO 80540.